I “met” Scottish folk cellist Seylan Baxter through another blog I write about my cello-playing adventures a couple of years ago when she commented on my posts about attending Scottish fiddle camp. She sent me a copy of her cello and harp CD, “2:40” (with harpist Cheyenne Brown, originally from Alaska, but now living in Scotland), and I was an immediate fan. The name of the CD refers to the 2 performers, and the 40 strings they play. So, when I learned they would be relatively close, at the Blackstone River Theatre in Cumberland, Rhode Island, on their first U.S. tour, I drove the 70 miles to see them. It was a dark and stormy night, and I could barely find my way home through the torrential rains after the show, but it was a concert well worth seeing; I loved every minute of it. I find it hard to describe Scottish folk music; it is fiddle music, Celtic music, but with an earthiness to it (perhaps the cello), a solidness and rustic flavor that appeals to me. The cello and harp are not a traditional instrumental duo, and the cello is not traditionally a solo instrument in Scottish music, but Seylan and Cheyenne make you believe that these two instruments, and Scottish music, belong together, and that the cello clearly deserves a starring role. The two instruments, the two young women, share the musical spotlight, and they were quite amiable and congenial as performers. In addition to playing the cello, Seylan sings; she has a wonderful voice, especially good for ballads. 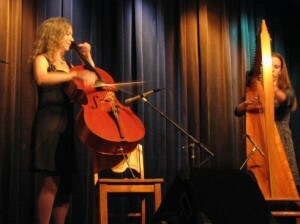 Seylan uses many contemporary techniques in her cello playing, chopping, rhythmic slapping of the wood, sliding up and down the string, pizzicato, and more. Seylan started out as a classical cellist, switching to Scottish folk music while in college. The first think you notice about her playing is, of course, that she plays standing up, her cello balanced on a chair. Cheyenne stands as well, her harp elevated a few inches to make this possible. I talked to Seylan about the standing, and asked why she played that way, and whether it was difficult. She said she started doing it because she was often the only one sitting. She experimented with different methods, including strapping on an electric cello, but using a chair turned out to be the easiest thing to do. Some other fiddlers use a longer end-pin or other methods. It took me about an hour and 15 minutes to drive to Cumberland, and three hours to drive home, through the rain. Still, not a bad distance to drive for a good concert.